The 2000 United States presidential election in Indiana took place on November 7, 2000, and was part of the 2000 United States presidential election. Voters chose 12 representatives, or electors to the Electoral College, who voted for president and vice president. Indiana was won by Governor George W. Bush. He won a majority of the counties and congressional districts in the state. 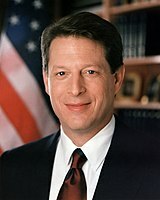 Gore only won two congressional districts and six counties. However, Gore won five of the six counties by very small margins. Lake County is Gore's best performance, winning with over 60%. Bush ran up the margins in more conservative rural areas to help him win the state. Bush won Vigo County with 49.7% of the vote, which is considered the most reliable bellwether county in the nation. This would also be the last time that Marion County and Monroe County went for the Republican nominee, as they went for John Kerry in 2004, for Barack Obama in 2008 and 2012, and for Hillary Clinton in 2016. Conversely, this is also the last time that Scott County voted for the Democratic candidate. Gore won only 6 of Indiana's counties compared to 86 for Bush. Technically the voters of Indiana cast their ballots for electors: representatives to the Electoral College. Indiana is allocated 12 electors because it has 10 congressional districts and 2 senators. All candidates who appear on the ballot or qualify to receive write-in votes must submit a list of 12 electors, who pledge to vote for their candidate and his or her running mate. Whoever wins the majority of votes in the state is awarded all 12 electoral votes. Their chosen electors then vote for president and vice president. Although electors are pledged to their candidate and running mate, they are not obligated to vote for them. An elector who votes for someone other than his or her candidate is known as a faithless elector. The electors of each state and the District of Columbia met on December 18, 2000 to cast their votes for president and vice president. The Electoral College itself never meets as one body. Instead the electors from each state and the District of Columbia met in their respective capitols. ^ "2000 Presidential General Election Results - Indiana". This page was last edited on 14 December 2018, at 17:43 (UTC).